We may have fun with words, but we won’t mince them. Your soul mate asked you to marry them in their own, wonderful unique way. You said “yes” and now you have your very own ring to gaze at, show off, and watch sparkle in the sunlight. So now it’s time — time to get your very own party started! Let’s start off with one simple ground rule: YOU are the bride. Original, awesome, gorgeous, just-getting-the-rest-of-your-life-started, one-of-a-kind-you! Your wedding shouldn’t exist on Pinterest, or Instagram, or anywhere on the World Wide Web where everything is the same except the woman in the white dress. This is your day — you have to seize it (#carpediem), own it, and work it girl! Pardon the trite “we’re all little snowflakes, unique in our own way” cliché. I mean – we are! Totally. Of Course. But it can be challenging to clear our minds of visual clutter and outside inspiration to embrace personal things about ourselves as individuals, and as couples, and translate them into wedding décor. 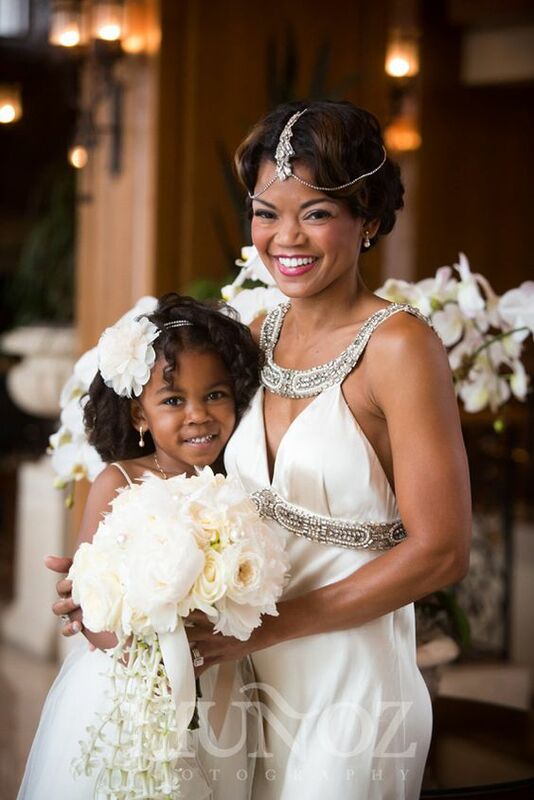 We L-O-V-E matching your story to your big day, and we relish a bride with big ideas. Bring us a challenge, an installation that you think can’t be done, or an idea that has been floating in your head ever since you first tried on that glass slipper. 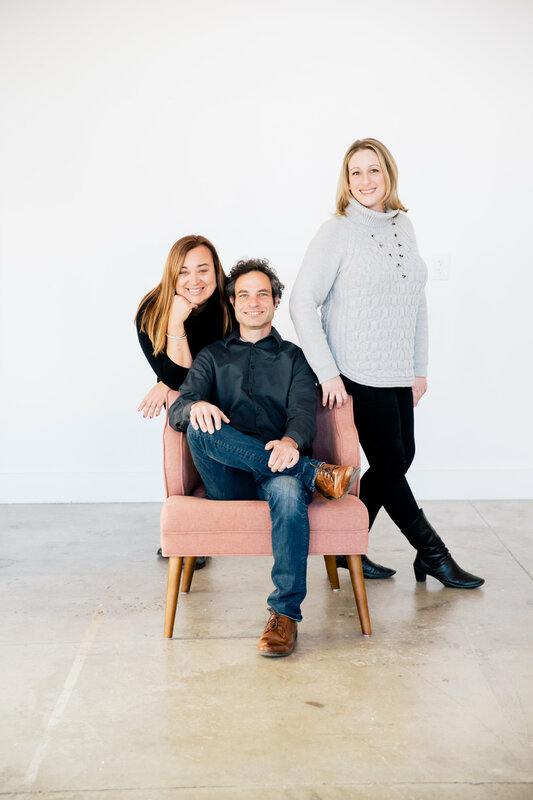 As professional designers, all we need is your vision, a few pictures, your color palette, and a little of your time to get to know you so we can incorporate those intimate details that tell your guests a little more about you and your newlywed. Custom weddings are our thing. So maybe our Instagram feed doesn’t have one cohesive feel. 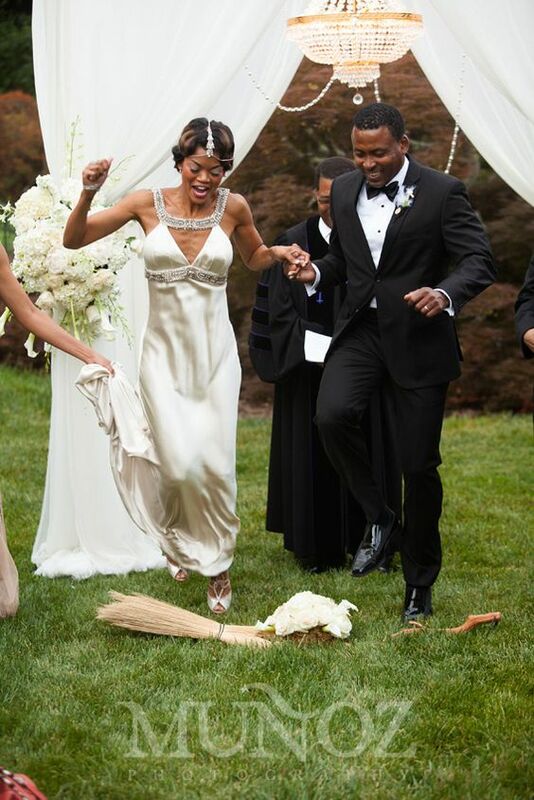 If it did, we wouldn’t be living our dream (read: creating your dream wedding!) 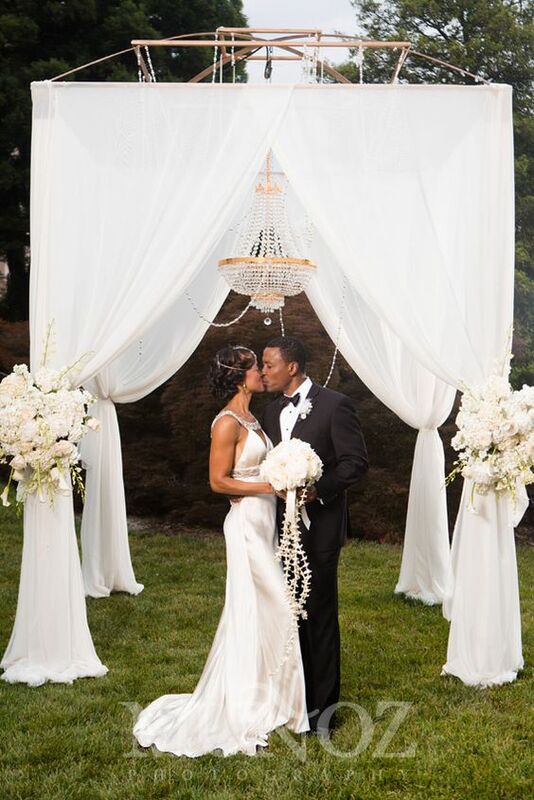 and our brides wouldn’t be making their weddings their own fairy tale..
What inspires you as a couple? Do you both love Converse? The New Orleans Saints? God? Biscuits, peanut butter, or Oreo milkshakes? You get the idea. Don’t worry — every bride has to take a minute to get her mind thinking this way. It can take a little coaxing to stretch our brides and grooms to find at least one piece de resistant that speaks to them as a couple. Sometimes, it is a private detail and sometimes (*ahem*) a bit more public. But every time, it creates the wedding they saw in their minds eye and felt in their heart. 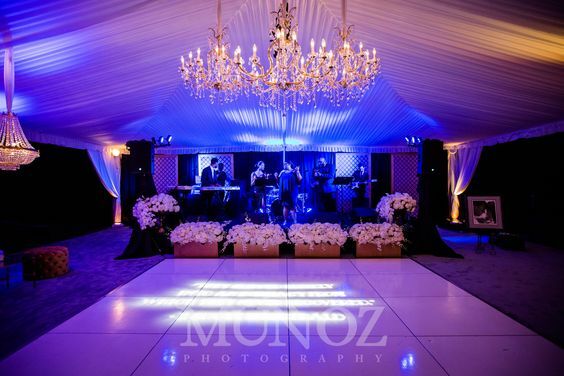 We’d love to share a few examples of custom weddings we’ve worked on recently. 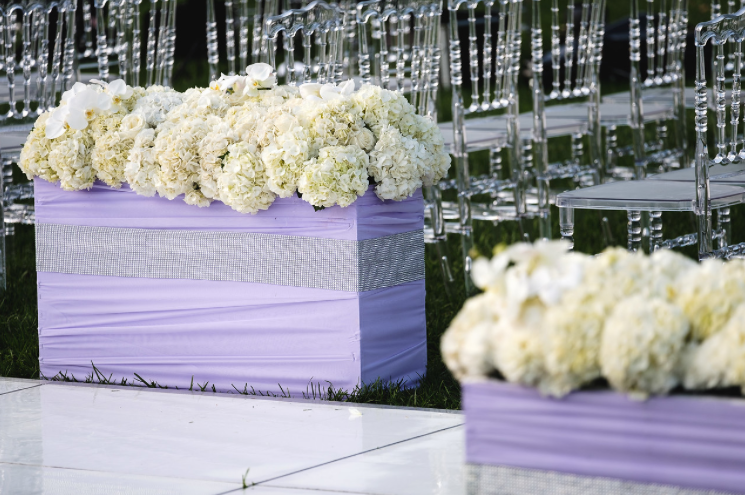 From smaller details to an overall wedding theme, here’s a look at how Blossoms and Baggie Goose help tell the story of who our beautiful couples are on the inside and out! 1920s. Wow do we love this style. Seriously, who doesn’t adore dear ol’ Zelda and Scott? 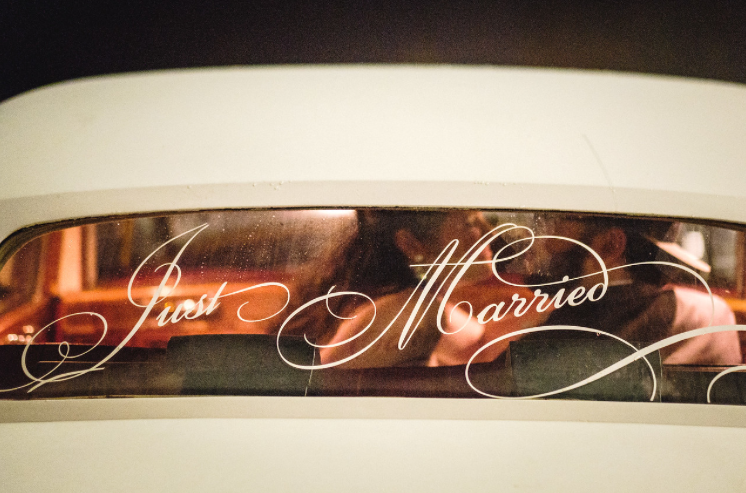 Prior to designing this wedding, we thought we’d seen everything from this period, from the lively, secret speakeasy, to the glamorous, mirrored ballroom. 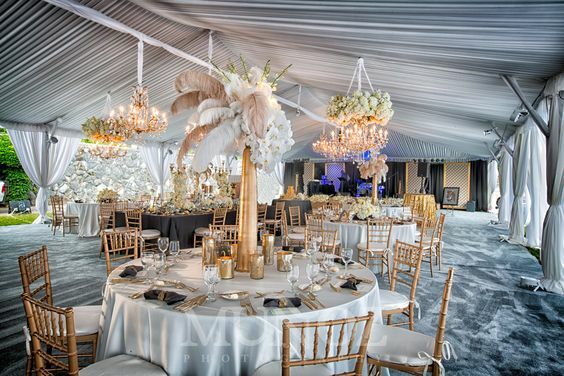 When this bride came to us, our plan was to give her “The Works.” For starters, we decked out the reception tent in black & gold and filled it with opulent details including candelabras, feathers, chandeliers, mirrors, and a place card display laid out in a pattern that matched the invitation. 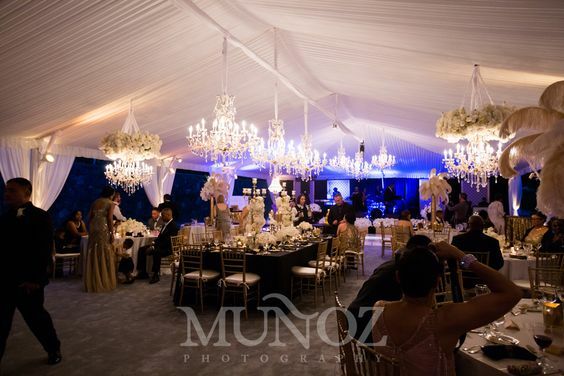 The tent was replete with ornate details and décor, so we decided to extend the design and create an entrance by placing an eight-foot orchid, hydrangea, and rose peacock outside on the sidewalk. 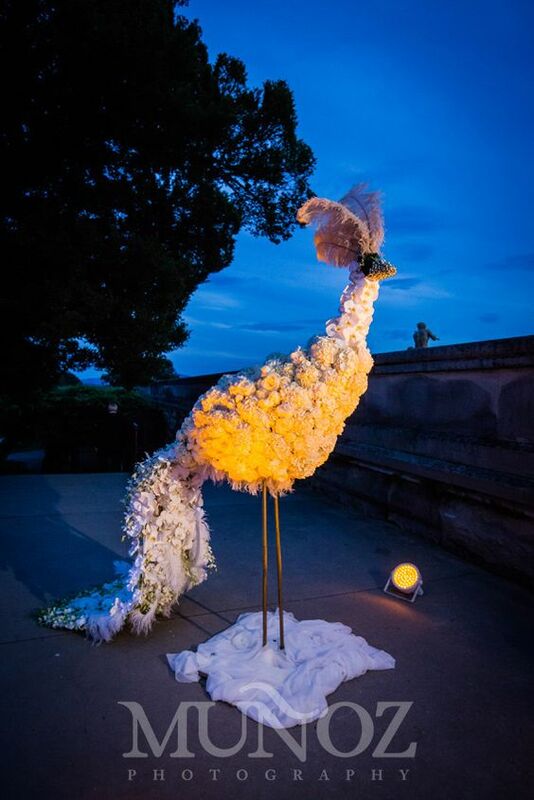 Our bride adored peacocks and peacock feathers, our groom loved the Jazz Age, so their wedding décor reflected both. Cinderella Upgrade. 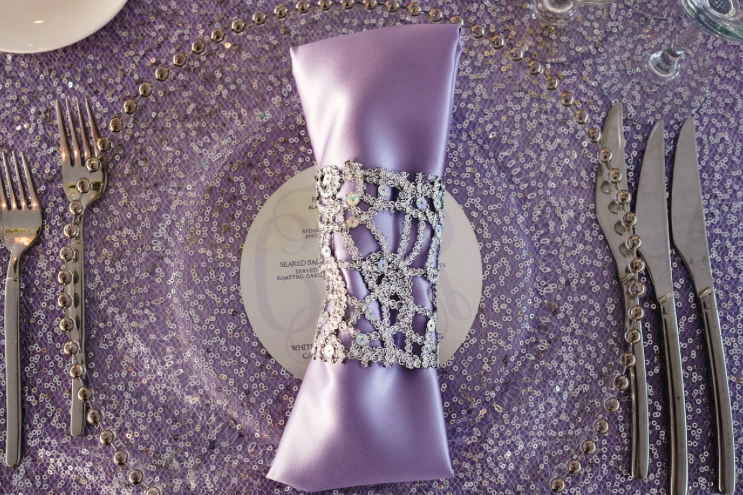 Yes, we have been known to wave our wands and create a wedding worthy of a princess. We’ve decorated carriages and horses, fashioned arrangements in glass slippers, bedazzled pumpkins, and hung crystals from tall, lush, royal-sized florals. This year, we had the privilege of taking that to the next level. 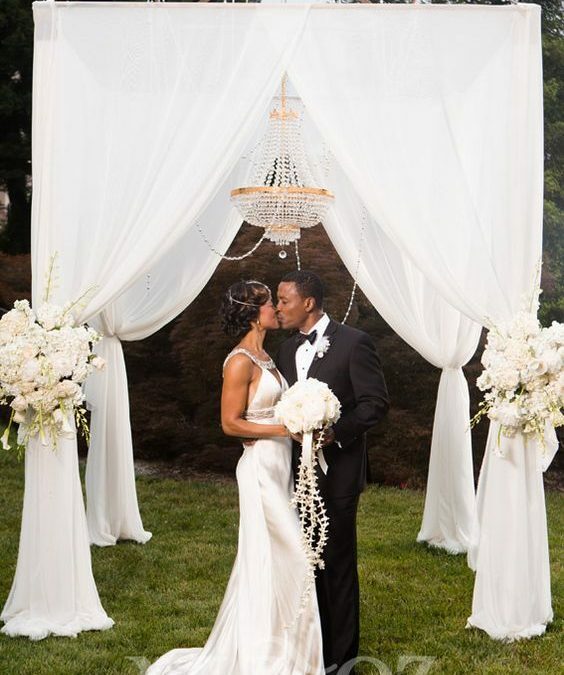 For this princess bride, we created the largest wedding aisle we’ve ever made, complete with an 11 foot rhinestone-covered entry way for the bride to enter through. 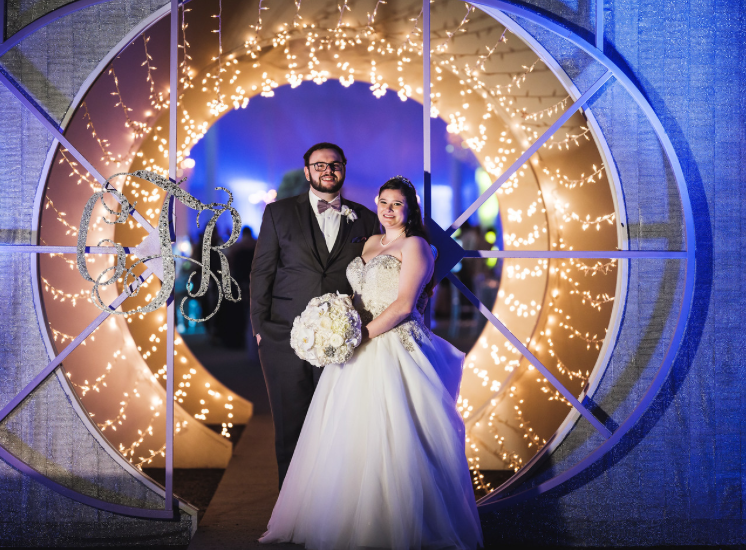 The reception entrance featured round gates, secured by a rhinestone monogram, that opened into a round light tunnel leading into the tent. Made in America. This patriotic couple loved the US of A almost as much as they love each other! They literally love everything about this amazing, resilient country right down to the purple mountain majesty and the amber waves of grain. PS — Beyoncé does a killer version of this patriotic anthem in case you haven’t heard it! Little bit country, little bit rock n’ roll. Actually it was more like a “little bit rap” but Donnie and Marie haven’t released that version yet. In all seriousness, we tapped our inner Osmonds to help a couple solve the problem of what to imprint on their cocktail napkins. They couldn’t decide on the right monogram to use so we suggested that they choose lyrics from two of their favorite songs. The bride went with a dreamy line from Elvis’s “Love Me Tender” while the groom chose to go with “Shake it, Shake it baby!” from Tu Pac and Dr. Dre’s “California Love.” Our paper company, Baggie Goose, was happy to oblige! 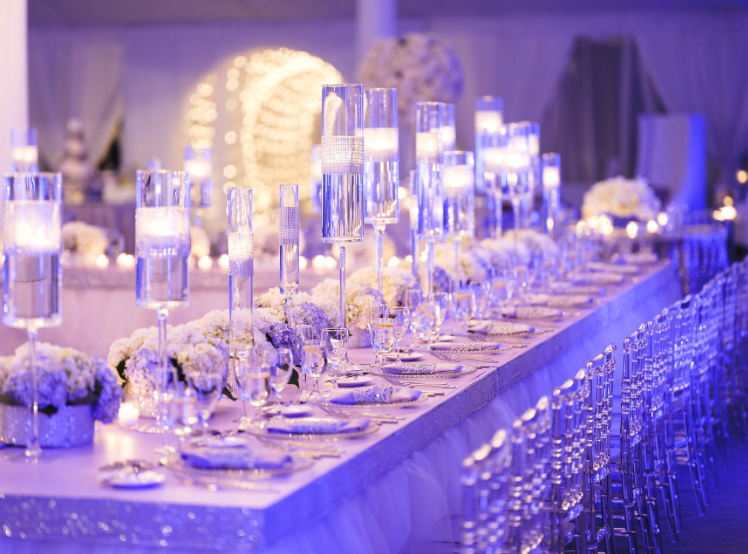 Your wedding planner can certainly lead you through incorporating these personal details into your overall wedding décor, but when you work with a designer, it can only be better. Let us get to know you so we can help you bring your vision to life, or even suggest some special touches you may not have thought of! Come visit in us in our shop, browse through items in our warehouse studio, share your Instagram and Pinterest pages with us…and I guess maybe Snapchat, too, if our kids are around to help us figure it out. The more we know, the better we are. Because we’re here to give you the best. When design matters. When your style really, really matters. When this day is your dream, your once in a lifetime, your no looking back kind of day. When you want something that’s never been done. 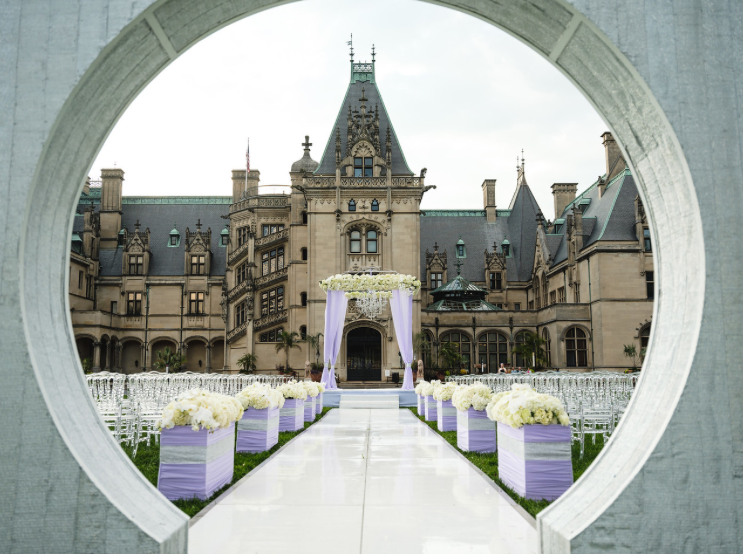 Blossoms at Biltmore Park and the Baggie Goose specialize in full event design, lit floral, stationery, and truly custom events. Straight outta Asheville …but we love to travel! To learn more about Blossoms of Biltmore Park and Baggie Goose, or to contact their shop, please visit their website.